Our Optima Hotel Global Connection is a revolutionary interface between Hotel PMS to the GDS, OTA and IDS channels allowing seamless integration between Optima PMS and the various global booking channels. This integration enhances the control on distributed prices and availability while receiving all reservations from these channels directly to the hotels' databases. 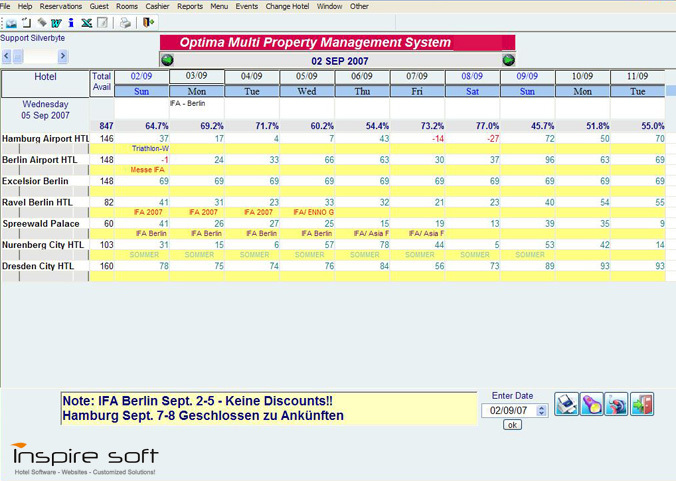 Interface to the GDS -	Optima Interface to Synxis allows you to update rates, inventory and restrictions across multiple third-party sites from a single platform. You can manage all the GDS and third party web sites with the same effort required to manage them in your own PMS. Optima PMS combines the expertise in channel management connection technology with extensive knowledge of hotel business processes that provide the leading on line distribution solution that fits your hotel needs. Provides you with flexibility when choosing which sites to update and allows you to easily execute pricing changes. This automatic process saves the costly resource required to maintain rates several systems and manually input reservations received via fax or email and saves the charges of a intermediate third party between the PMS and the booking site.